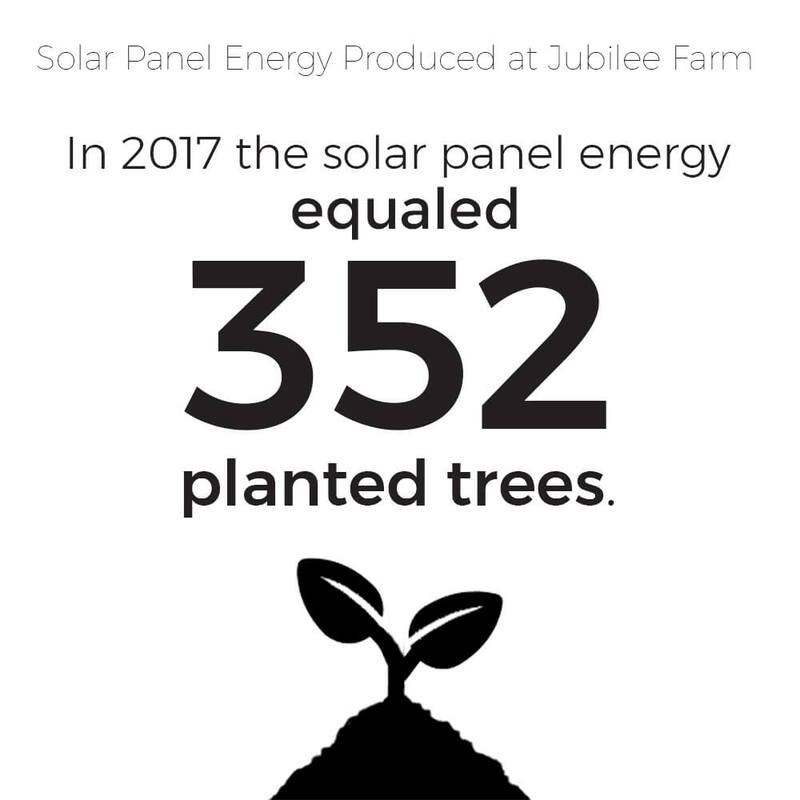 Starting in November of 2016 Jubilee Farm has been documenting the solar panel system production information. 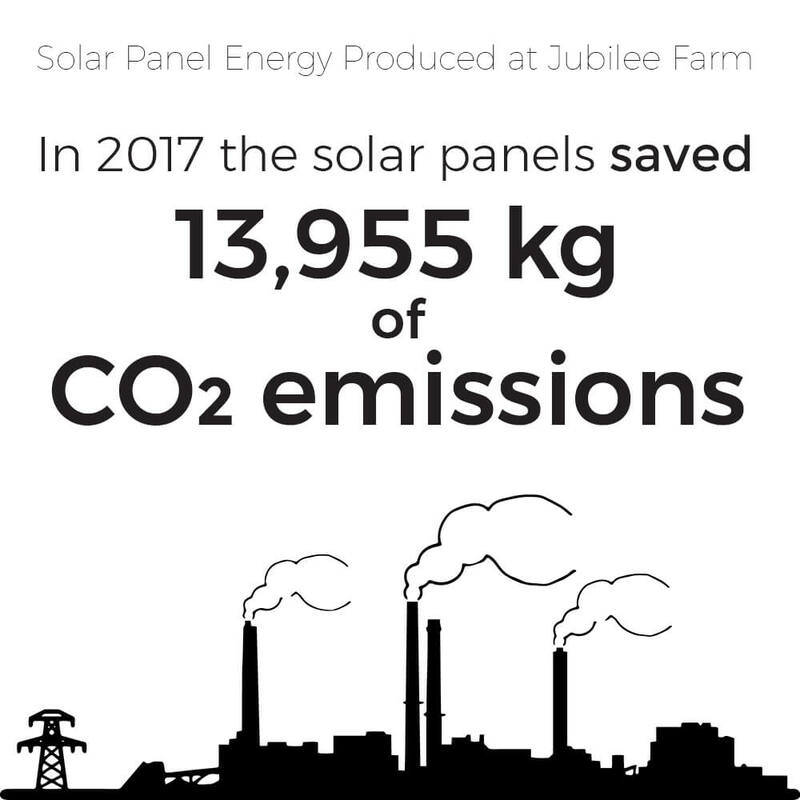 In 2017, its first full year of operation, the solar panels produced 8.24 MWh of energy, saved 13,955 kg of CO2 emissions, lighted the equivalent of 27,369 light bulbs for a day, and equaled 352 planted trees. In 2017 the largest recording was in June with 972 kWh and the lowest was January with 289 kWh. 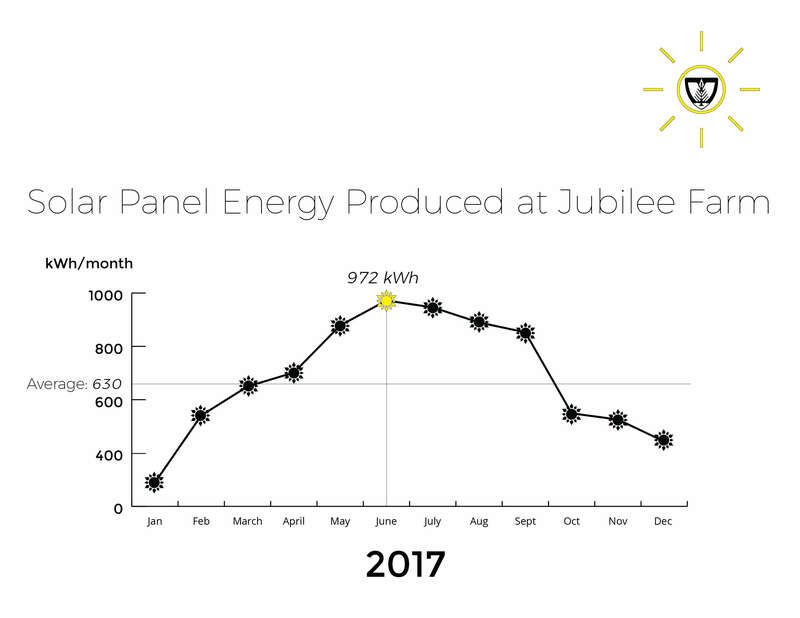 Over the year there was an average of 630 kWh and the yearly megawatt hours totaled 8.24 MWh, or 8,2400 kWh. The 13,955 kg of saved CO2 emissions nearly removes one Illinoisan’s yearly CO2 emissions. 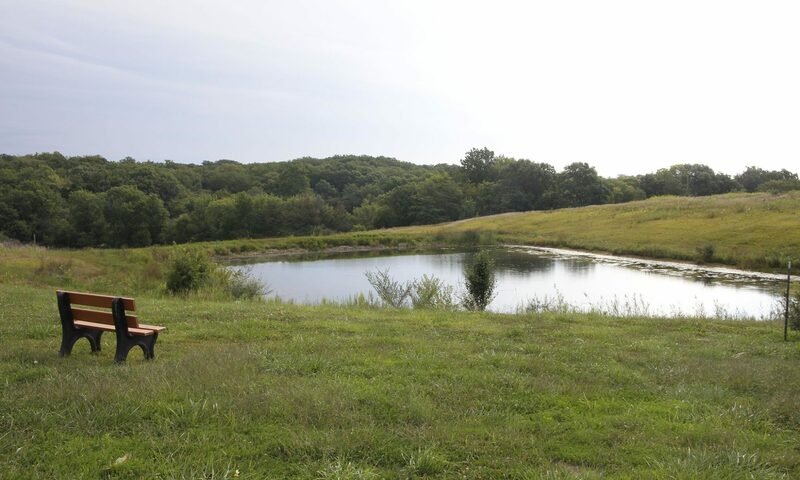 An Illinoisan produces around 16.5 tons or 16,500 kg CO2 emissions a year. The CO2 emissions produced by human activities such as coal, natural gas, and oil production are the largest contributors to carbon dioxide in Earth’s atmosphere causing a greenhouse effect. The reduction in CO2 emissions helps with changes in the land like damage to all forms of plant life from the smallest blade of grass to the largest forest. People in Illinois, per person, produce a lot of CO2 emissions. It goes without saying that the United States as a whole still has a long, long way to go to reduce the damage it is causing the environment, but many of steps have been made since 2008 to reduce CO2 in green house gases. 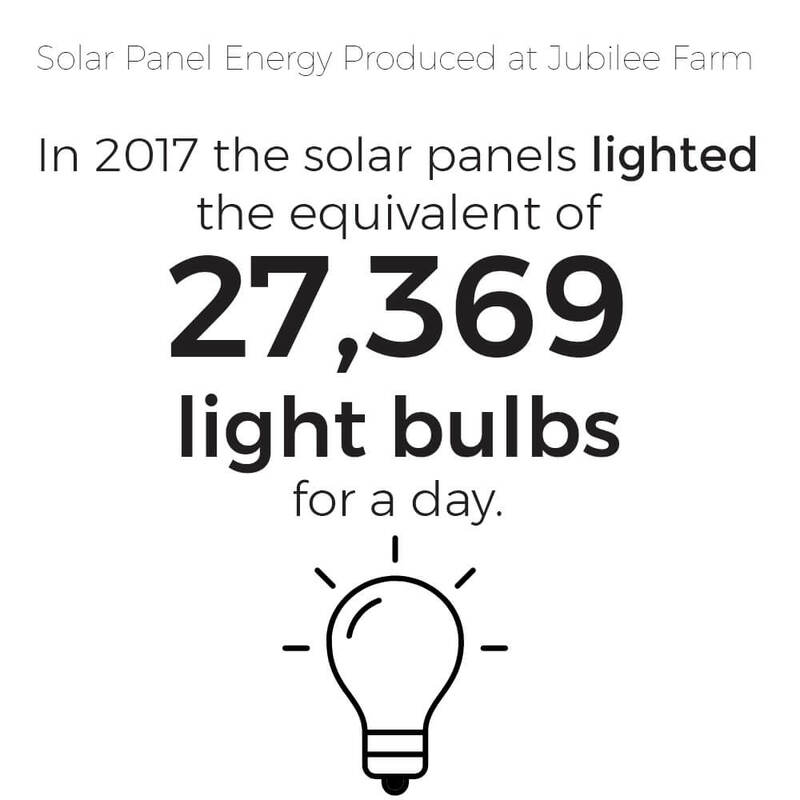 In one October day the Jubilee Farm solar panel system produced enough energy to light a small room with CFL or LED lights for a year. In a one day snapshot the most sun was captured at 12: 45 p.m. producing 4.5 kWh of energy; the system produced 33 kWh for the whole day of October 16, 2017. If we look at the whole week of October 10-16 the system produced 111 kWh of energy. To illustrate what that looks like an old 60W light bulb gets about 44 kWh of use per year and newer bulbs use less than 10 kWh a year.